Where can I purchase the shower curtain? Visual Comfort; you will need to purchase it through a design professional. Visual Comfort can be purchased in multiple lighting stores as well. I love the light fixture. Do you have any details for it? What would be the US alternative for the paint color? - Any recommendations for an alternative color I can buy in the US for the paint (Farrow and Ball Drawing Room Blue No. 253)? Farrow and Ball is available in the US. You can go on their website and find the closest location. What did you use for the baseboard? - Does the base match the crown moulding or does the white tile go all the way down to floor? Where was the mirror purchased? The interior designer procured that, sorry. Cabinet pulls? - Where can I purchase the cabinet pulls on this vanity? It is a Pottery Barn vanity and the pulls came with it. Countertop - What is this? It's beautiful! What is the color of the paint? - I'm looking for a dark blue for my remodel bathroom and I was wondering what the color is of the paint on the wall? Shower curtain ? - Shower curtain? It's a Ralph Lauren fabric selected by interior designer Melissa Mahon, Interiors. 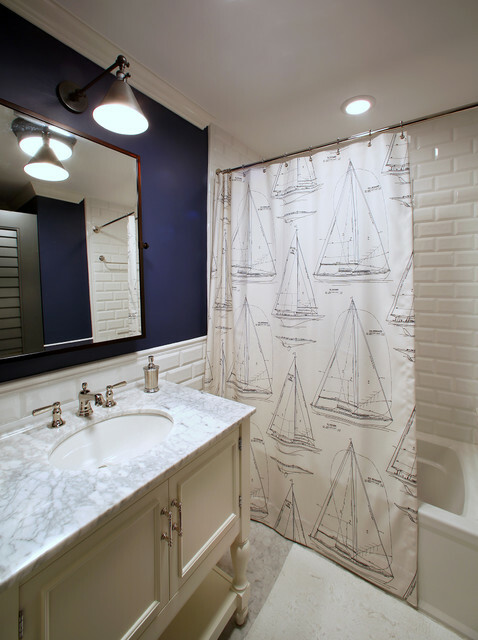 all white bath/shower with cute shower curtain and contrast colored wall in navy. Very appealing for hall bath.